Staying in touch with your patients outside of an appointment is more important than you might think, especially in a fast pace society. Learn from 7 different veterinary industry experts on the best ways to engage with your clients, year-round. All four pieces rely on the other pieces. If you are missing a piece your marketing program will be like a car going down the road with three wheels! People want to see the amazing relationship that their James Herriot vet has with all of their patients. Share content with them throughout the year that shows that bond. Other than that, make sure you educate pet owners online. Education is the key to marketing effectively and building trust. But don’t be boring about it! Clients alike thrive on "every." Every time they bring in their pet, every exam (no matter which tech or doctor), they know there will be consistency and thoroughness in their interaction. Stay top-of-mind with your clients between visits by finding ways to communicate, educate & connect with them on their phones! 1) Survey your clients to see where they spend time on social media, and how they prefer to communicate. Focus on platforms more than 30% of your clients actively use, and don't be afraid of using locally-targeted social media ads. 2) Post a lot of "behind the scenes" action on the platforms they frequently use. Sharing patient and team photos/videos on Facebook, Instagram & Snapchat is a smart way to stay top-of-mind. Don't post the same content on each platform, though. Give them a reason to follow you by keeping it varied. 3) Be helpful when you text or email your clients. I love sending little reminders to give heartworm prevention on the first of the month, for example. Emails and texts like this are mutually beneficial, and I often have clients thank me for them! More than anything else that you measure, Patient Lifetime Value (PLV) is the most significant indicator of your ability to engage your clients from womb to tomb. Since it measures client spending, visit frequency AND longevity with the practice, PLV is the REAL indicator of a practices big picture long term vision of success. To stay top of mind, show clients the love all year through, not just once a year when they come in for their pets' vaccines. - Invite them to hospital events. - Keep them up-to-date on pet news. - Alert them when there are recalls or new risks to their pets. 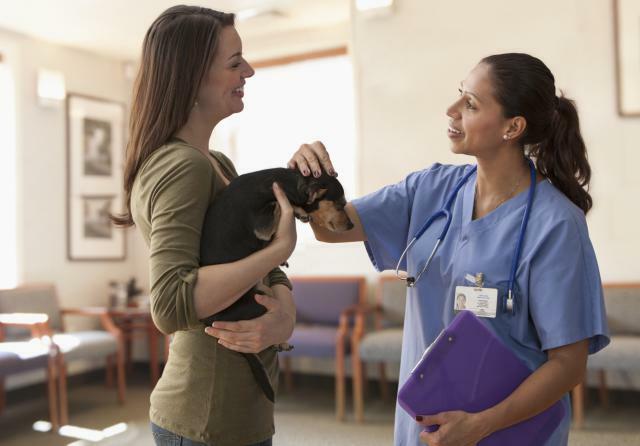 - Tell them when you have a special on pet health services. - Send them reminders when they should give their pets flea, tick and heartworm medication. - Invite them to come in when you have a new solution that can help their pets and make their lives easier, like the new dog flu vaccine or doggy day care openings. - Send their pets birthday cards (and/or Valentine's cards). And, sometimes, just send them a quote, cartoon or cute pet video you think they'd enjoy. Proactively manage your active patient count to spot trends and get a true sense of whether your practice is expanding or contracting (and at what rate). Take action to make sure that there aren’t any holes in your practice. Read more about this in Martin's blog post: Is There A Hole in Your Practice? How to actively measure and manage your active patient count.